I'm not sure exactly why, but lately a higher-than-usual amount blissfully addictive, deliciously poppy music is landing in my inbox. Maybe it's the fact that summer's approaching, or simply that more bands are tapping into their love for accessible melodies and catchy hooks. 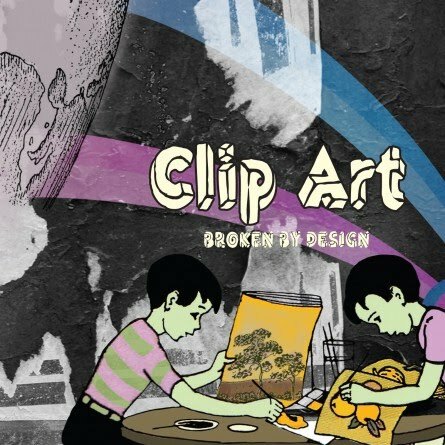 Whatever the reason I'm certainly not complaining, and of the finest examples to come to my attention recently is a band by the name of Clip Art and their debut EP, Broken by Design. Led by singer-songwriter Andy Rosenstein and featuring members of other notable Chicago bands including This Is Me Smiling, Gold Motel, Dorian Taj and JC Brooks & the Uptown Sound, Clip Art's sound is rooted in Beatlesy melodies and classic power pop. The crowning jewel of the five-song EP is the first track, an upbeat rocker called "Dead Letter" with an effortlessly wonderful chorus that grabs you almost instantly. Deeper in, "I Was Gone," "Better" and the title track are exercises in heartfelt soul-pop calling to mind greats such as Elvis Costello, Squeeze and Aimee Mann. Rosenstein's expressive, up-front vocals really shine on these cuts and accentuate the strength of the music and lyrics. Finally, "Six Sides" brings a burst of energy into the second half of the EP with a zippy pace and some playful, Farfisa-sounding keys. "Dead Letter" alone would make Broken by Design highly recommended summer listening for any fan of indie pop or power pop. The fact that there are four other excellent tunes on the EP is just icing on the cake. Don't hesitate to check this one out. Broken by Design is available now via iTunes, and you can check out Clip Art live by heading to Double Door this Saturday, May 29 for a show that will also feature members of Morphine & Jeremy Lyons, Rescue School and Dorian Taj (more info and tickets here).